The public is fascinated by exotic names. West Nile Virus. Ebola. Avian Flu. This is in spite of the fact that West Nile Virus killed 7 human beings in the US. For all the rhetoric about bioterrorism and anthrax and the siphoning off of much-needed funds into these ares by the administration, what finally kills us is what's in the backyard, not what's imported from abroad. What needs to be paid attention to is the much larger threat of antibiotic-resistant infectious diseases in this country. Before they consider threats from beyond borders, they need to consider threats within. The statistics are uncomfortable to say the least. Here's a very recent important JAMA report from October 2007: 18,000 deaths from MRSA. That's a stupendous number in this age of antibiotics if we think about it. It makes the number of MRSA victims more than the number of AIDS victims. Yes, more than the number of AIDS victims. That should put things in perspective. "These data represent the first US nationwide estimates of the burden of invasive MRSA disease using population based, active case finding. Based on 8987 observed cases of MRSA and 1598 in-hospital deaths among patients with MRSA, we estimate that 94 360 invasive MRSA infections occurred in the United States in 2005; these infections were associated with death in 18 650 cases. The standardized incidence rate of invasiveMRSAfor calendar year 2005 was 31.8 per 100 000 persons. The incidence of other important invasive pathogens in 2005, such as invasive infections with S pneumoniae or Haemophilus influenzae, ranged from 14.0 per 100 000 to less than 1 per 100 000, largely due to the availability and success of vaccination." For once, the Bushesque rhetoric "Be afraid" holds at least some water. 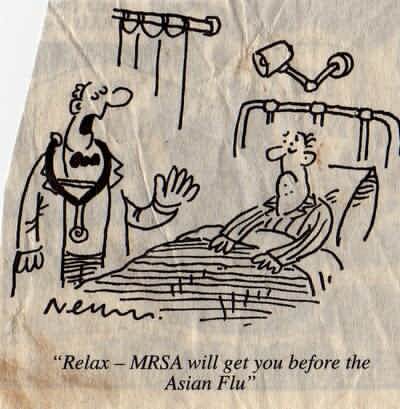 "Take MRSA seriously" you got to be kidding,it has gotten worse than seriously. that was supposed to be an understated way of saying it. you are right that it's worse than serious. This is scary stuff. But there is now a new technology with university research proving effectivness in helping kill MSRA and other bateria's, virus and fungi from hard surfaces in your house, office or work place. Eliminating exposure is a sound step to avoiding this problem. Check out the information on www.airzone2.blogspot.com or www.airzonetoo.blogspot.com a part of the Healthier Living blog sites.